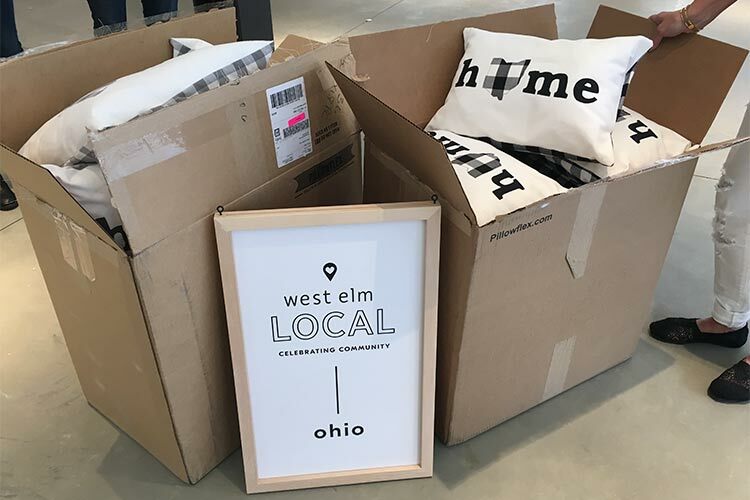 The national furniture and home decor retailer West Elm opened its first Cleveland location on Thursday, May 24, in the mixed-use district Pinecrest in Orange Village, with a grand opening planned for tomorrow, Thursday, June 6. Even through the popular retailer has stores in more than 85 cities nationwide and is part of the Williams-Sonoma group of companies, West Elm arrived in Cleveland with a local spin. In addition to home goods and decor, the 11,000-square-foot store carries a selection of goods from eight Ohio makers—five of which are based in the Cleveland area—and boasts a décor that gives a nod to Cleveland’s manufacturing history. The area artists are Boundary & Thorn (fine art prints and greeting cards), Gordon Square-based FOUNT (handmade leather accessories), Lauren HB Studio (handmade geometric dishes out of Lakewood's Screw Factory), Linda’s Other Life (custom stitched Ohio-themed pillows), and Little Korboose (organic home goods). Lauren Herzak-Bowman, owner of Lauren HB Studio, says she first approached West Elm about the store’s Local Program a couple of years ago to sell in the Columbus location, and she is happy to be featured in her hometown. 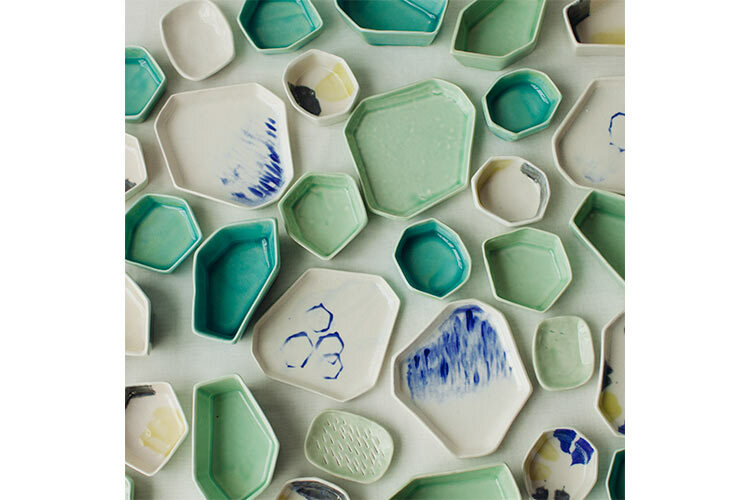 All of her dishes for sale at West Elm are under $30 and come in a variety of colors. Linda Lackey, who taught English at Strongsville High School for 30 years before launching Linda’s Other Life on Etsy, says it felt like she got her first West Elm order instantly after the company contacted her about selling her Ohio-themed pillows. “I learned to sew as a young child from my mother and grandmother, but it wasn’t until recently that I realized my hobby could be a profitable and enjoyable business,” she observes. Three Columbus makers—Bearded Woodcraft, Little City Love, and Root 23—will also be featured in the Pinecrest store. Wickberg says anyone can submit local artisan recommendations to West Elm. The Pinecrest location also honors Cleveland’s rich manufacturing history in the store’s layout and design. An ornamental steel screen behind the register reflects Cleveland’s reputation as one of the prominent steel and ironmaking hubs, and the backing is made of maple wood—a tree native to Ohio. The checkout counter features a sculpture made of reclaimed slate triangles cut from blackboards that once hung on the walls of Cleveland schools. To further deepen West Elm’s local connections to the Pinecrest location, West Elm officials notified LAND studio about two months ago that it had been selected as their nonprofit partner for the Pinecrest opening, according to Tara Turner, LAND studio’s director of development and communications. A portion of the grand opening proceeds will go directly to LAND studio. Several Pinecrest stores are opening this month, with Shake Shack, Graeter’s Ice Cream, Bibibop Asian Grill, Club Pilates, Pottery Barn, Williams-Sonoma, Apricot Lane Boutique, Laura of Pembroke, Scout and Molly’s Boutique, and Vineyard Vines all holding grand openings this week. West Elm's grand opening celebration will be held tomorrow, Thursday, June 7 from 6 to 8 p.m. There will be a live DJ and refreshments. Guests will enjoy a 15 percent discount on all purchases during the event. Click here to RSVP.